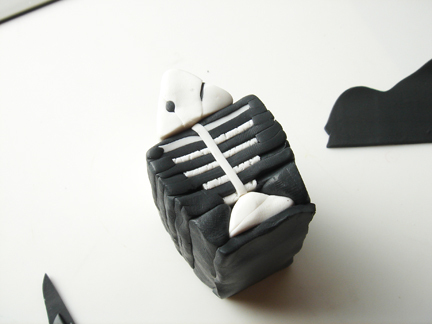 Spooky fish skeleton that is not just for Halloween. At least that is what I think anyway. I hope you have fun making it too. 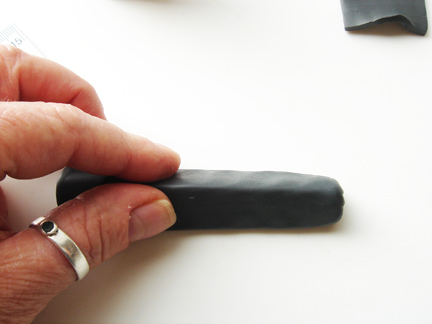 Condition and roll out the black in to a sheet on the thickest setting in your clay machine. 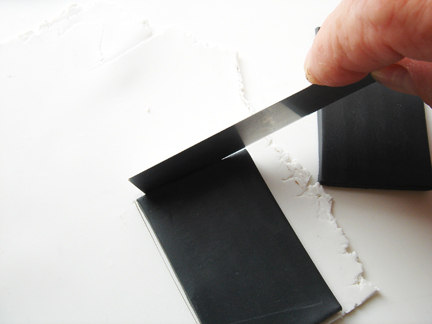 Add a sheet of white to the center of the cut on one side. The sheet will be rolled out on the 3rd thickest setting. 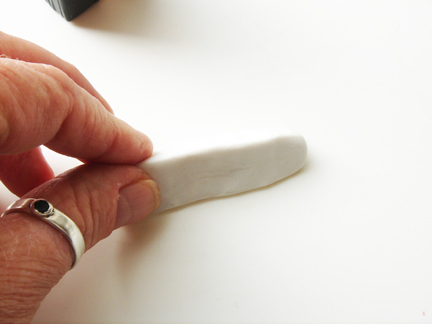 Roll a 1/2″ coil of the white clay and press in to a triangle with your thumb and forefinger. 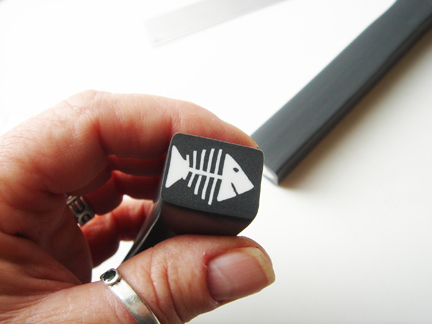 Add the triangle point up to the fish bones. Like this. 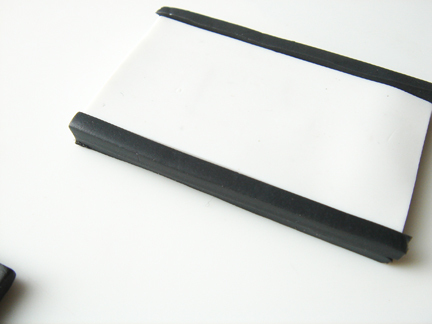 Roll a 3/4″ coil of black. Press that coil into a triangle too. Make the points of the triangle pretty sharp. 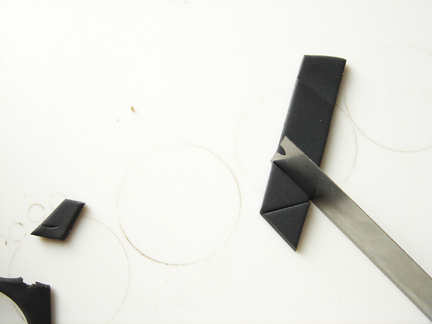 Trim the triangle black piece to fit the stack of rib bones. 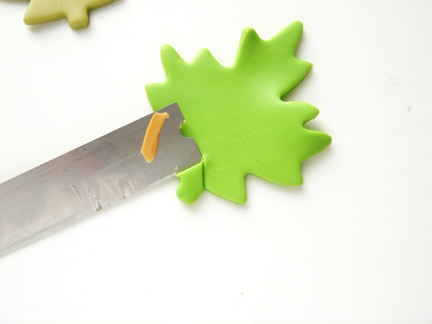 Cut that triangle piece in half. Make the points even sharper if you have too. 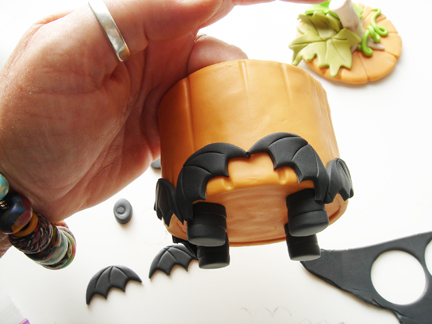 Add one half to one side of the tail and the other half to the other side of the tail. 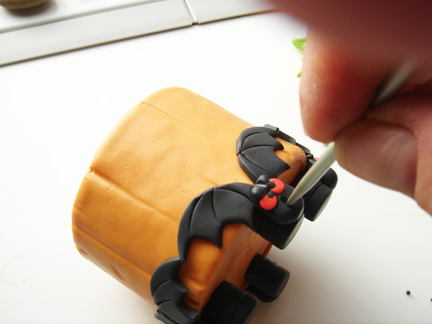 Press in to the tail evenly. 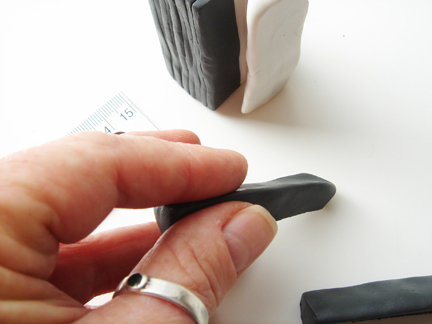 Add a sheet of black clay rolled out on the thickest setting in the pasta machine to the bottom of the tail. 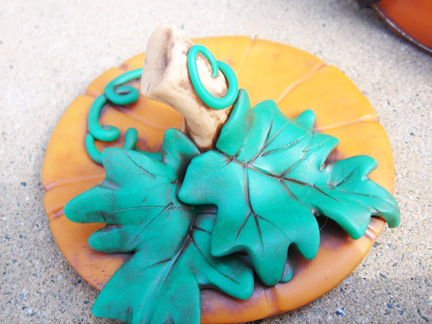 Roll a 1″ coil of white clay and trim to the length of the stack of bones and tail. Press this in to a triangle shape and see if it is the same size as the stack of bones and tail. 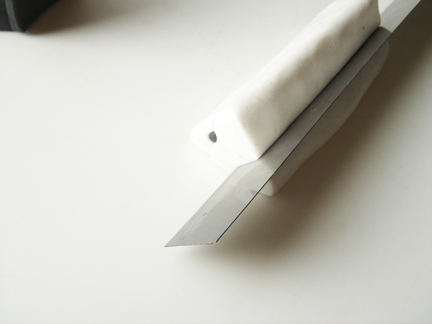 Cut straight down and cut off one point of the triangle. 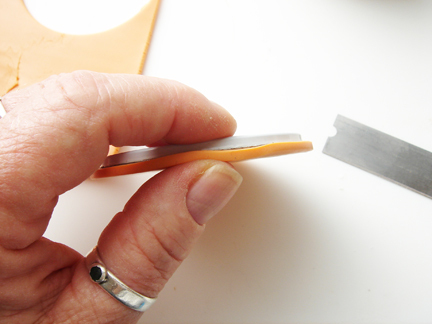 Place a bamboo skewer or brass rod on the cut side of the big triangle on the top 1/3 of the triangle. 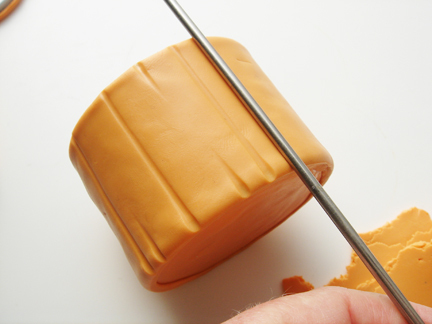 Press the rod gently in to the triangle. 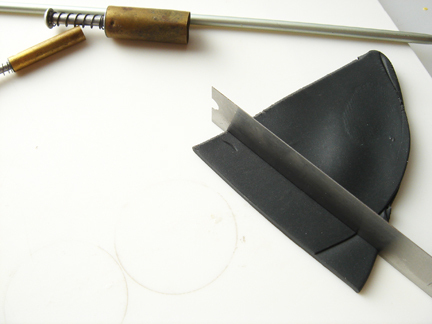 Add the other cut sections right back to the triangle with the brass rod still in place. 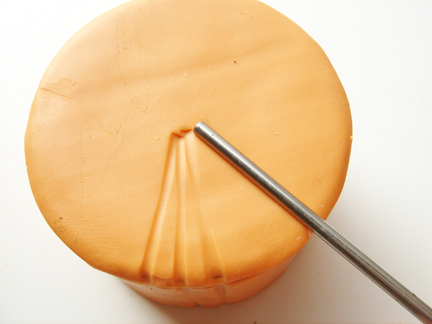 Form the 2nd cut half around the rod to form a half circle cell in the both pieces of the triangle. Peel the one section off the other section and remove the brass rod. 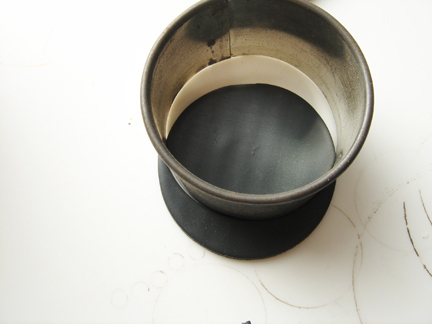 Roll a coil of black clay the size of the brass rod about 1/8″ and place in the channel of the big part of the white triangle. 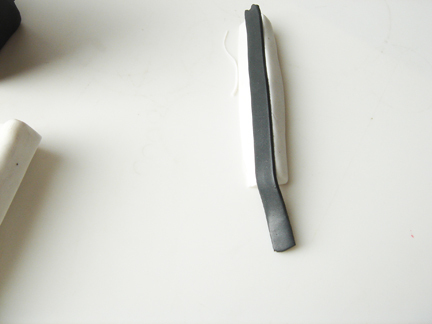 Cut off the black coil so it is the length of the white triangle piece. 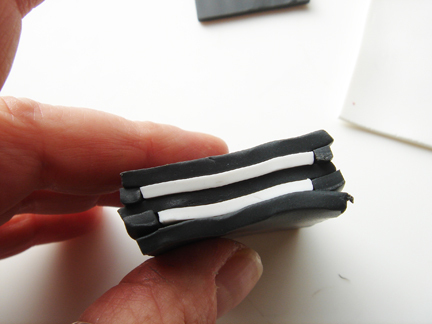 Place the smaller section of the triangle together with the larger one leaving the black coil inside. 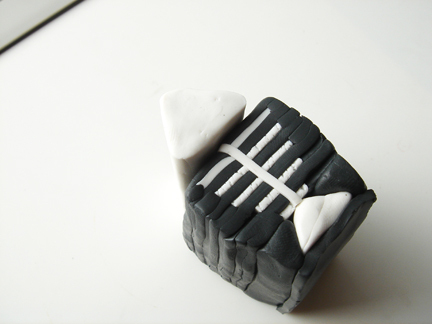 This will be the eye for the fish bone cane. 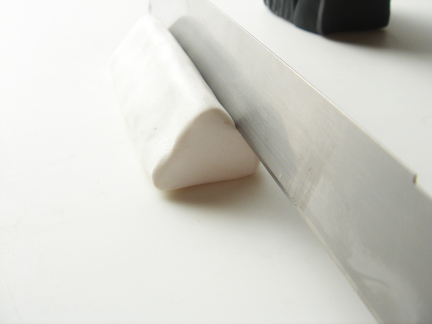 Using your blade again cut into the opposite side of the cane at more of an angle. 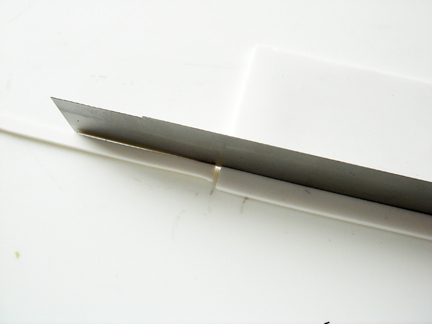 Cut all the way through to the bottom edge of the white triangle. 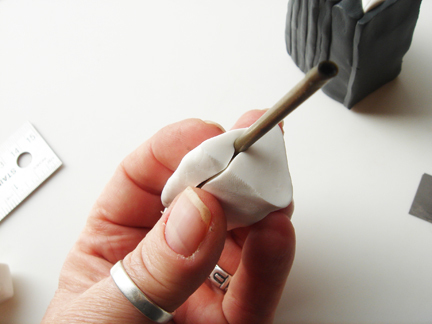 Pull off the small section with never changing the orientation of the pieces. 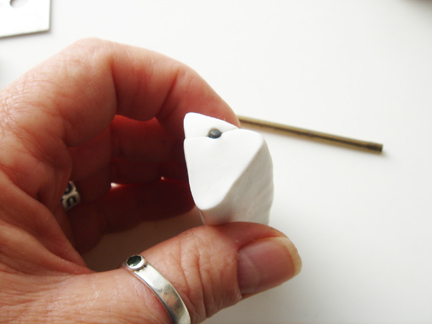 Roll out some black clay on the 3rd thickest setting and place a strip about 1/4″ in width on the length of the small cut off white piece of the larger triangle. 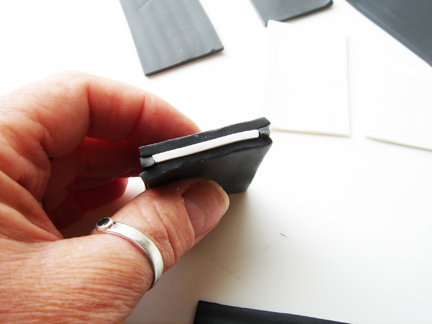 This piece will slide under the bigger white piece of the triangle, so the black strip will go along the outside edge of the small piece. 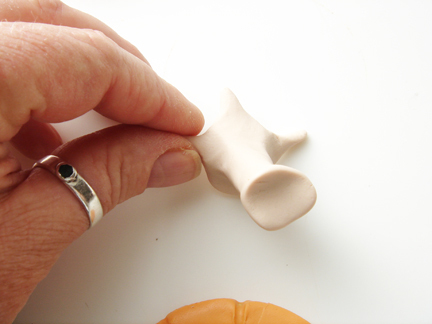 Using your thumb and forefinger compact everything together. 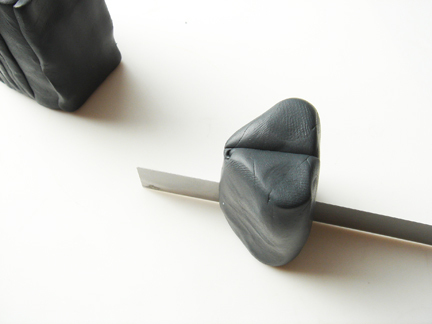 Shaping back in to a triangle and pressing the small piece with the black together with the large piece of the triangle as if it is one piece. 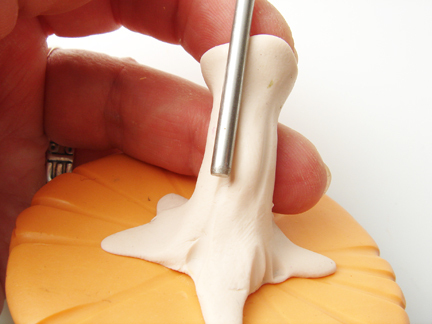 Place the triangle head in the center of the bones on the stack. 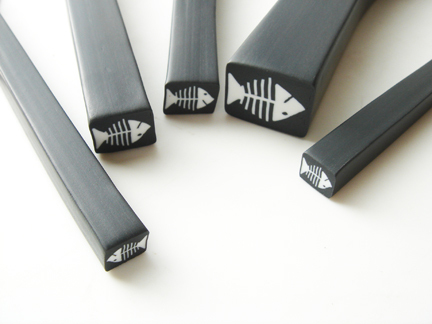 Roll a black coil that is 1 1/8″ in diameter and the length of the stack of fish bones. 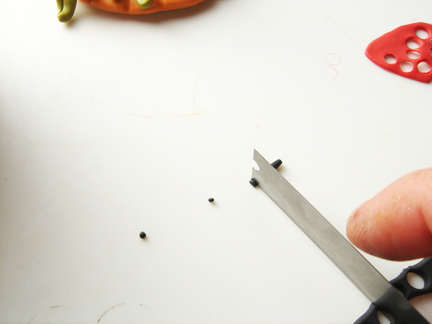 Press in to a triangle shape and cut the pieces in half. Make the points of the triangle more defined. 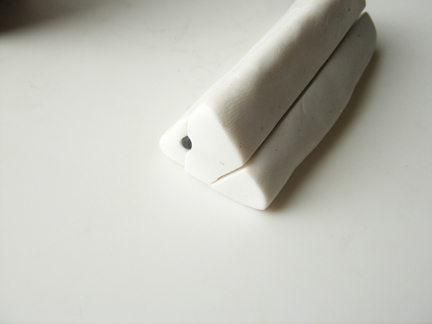 Place one half on each side of the head of the fish. 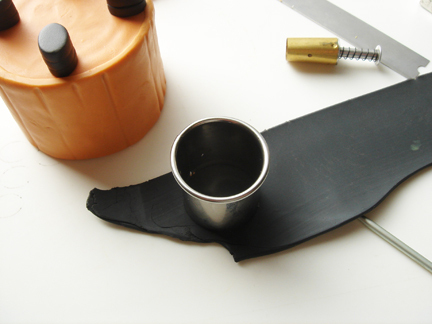 Wrap all sides with a sheet of black rolled out on the thickest setting. 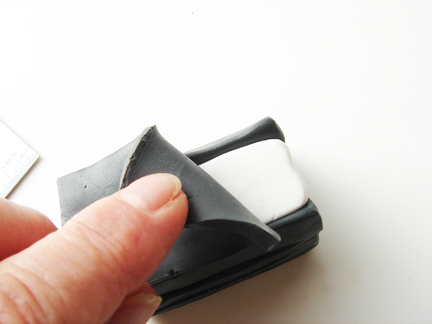 Reduce by compressing all sides one at a time with the palm of your hand and then flipping the cane from end to end and compressing all 4 sides of the cane again. 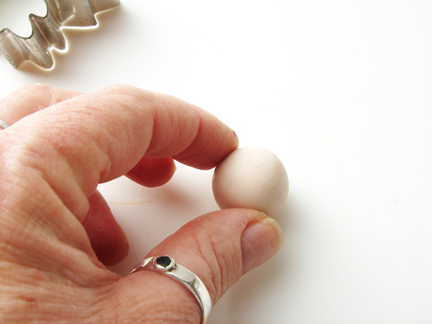 Repeat this slowly and gently until the cane is smaller by half the size. 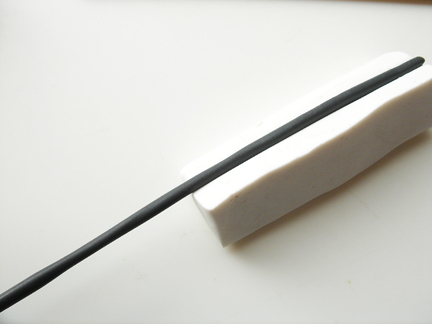 It is best to be more forceful in the center of the cane to force the inside of the cane out. As Katherine Dewey once told me “Oh, you are pressing on the “x” and the “y” axis which forces the “z” out through the center”. 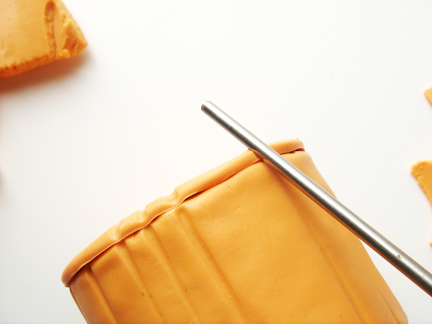 This is the inside of that cane using that method! 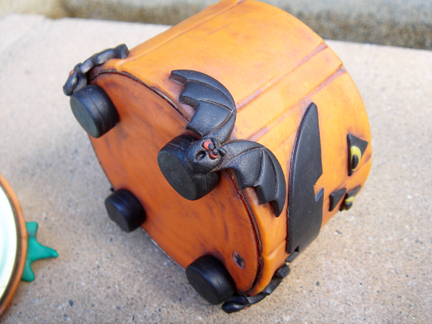 Enjoy and have a safe and fun Halloween! 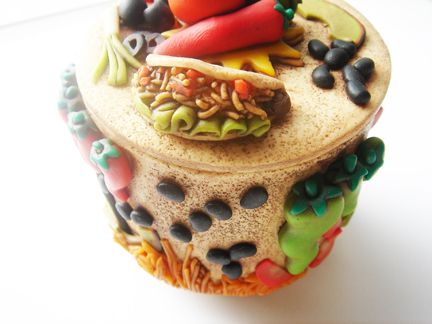 Everything you would need for a taco dinner. 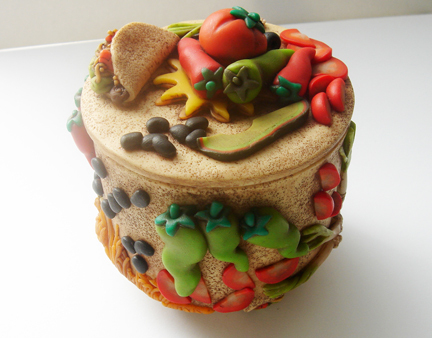 Olives, avocados, and red peppers. Beans, Cheese, and green peepers. 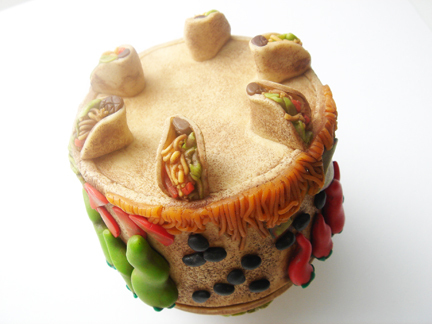 The whole thing has a taco shell finish. 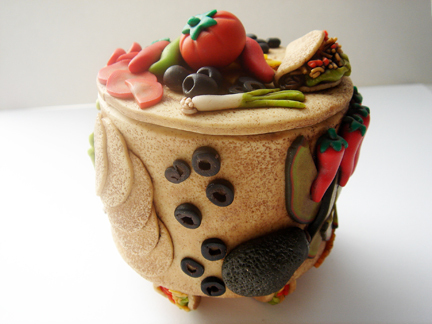 This has got to be one of my all time favorites and it makes me hungry. 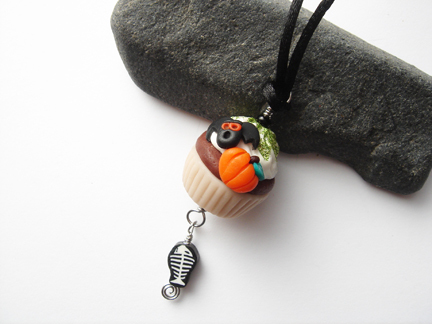 Mrs. B is extending the giveaway for the bat and pumpkin cupcake necklace I made giveaway until the 1st of November so if you still want a chance you can hop on over there and add your name to the bunch. 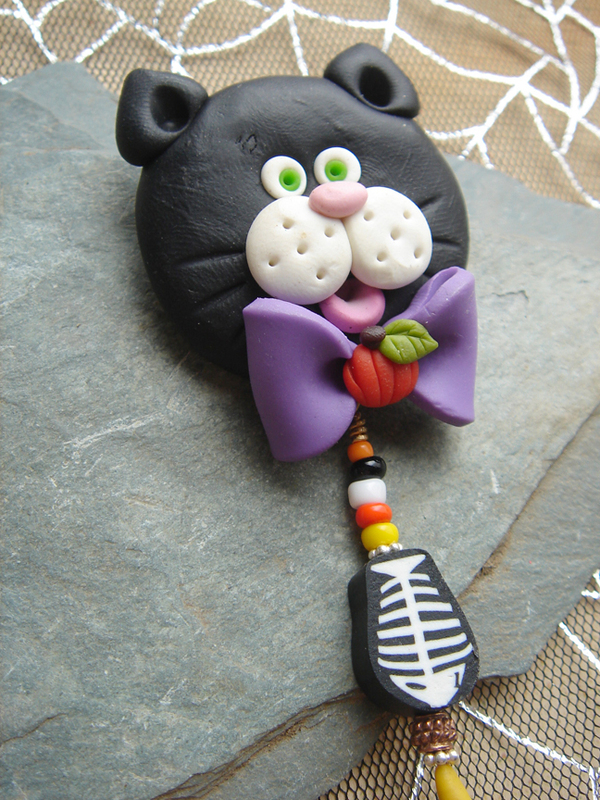 You can see the necklace in the picture below the cat picture. 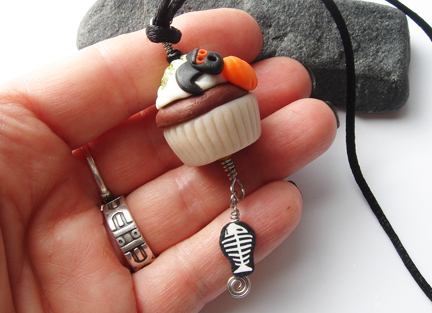 Thank you for your votes on the Fave Crafts Blog Hop. I did not win, but I feel great about bringing a ton of new people and unique votes to their web page and I could not have done it with out all of you. Blessings all over all of you. 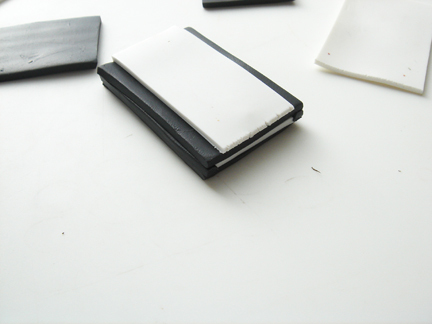 I cut five sheets in black 2 1/8″ by 1 1/2″. 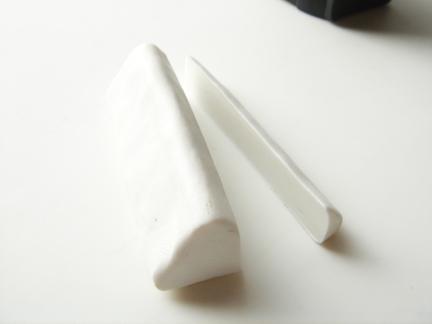 Roll the white clay out on the 3rd thickest setting. We will cut down the white sheets to size but these are a great size to start with. 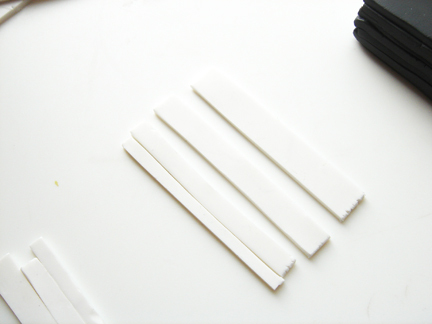 Cut out 5 sheets of the opaque white 2 1/8″ by 1 1/2″. 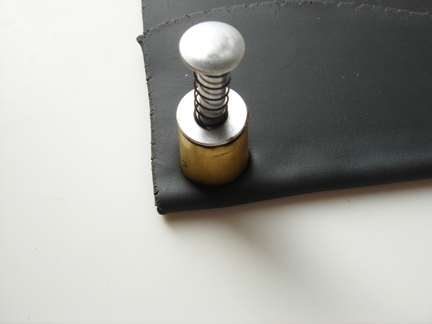 You can use a black sheet as a template. 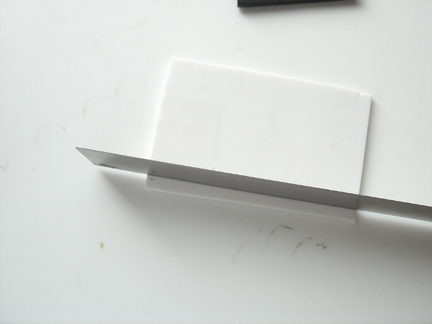 Cut off 1/8″ from each side of the long side of the white sheet. Lay a black sheet down and place this white sheet in the very middle of it. 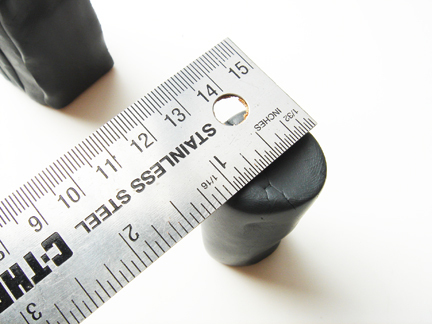 Take another sheet of black the same size as the ones above and rolled out on the 3rd thickest setting like the white sheets above and cut off 1/8″ from the long side. 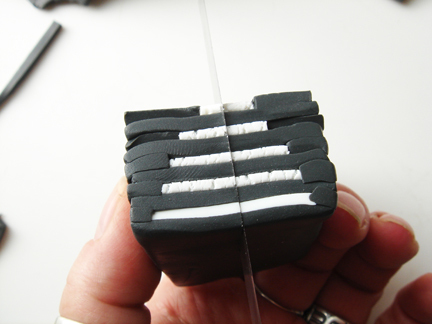 Place the black strips on the side of the white sheet on both sides. 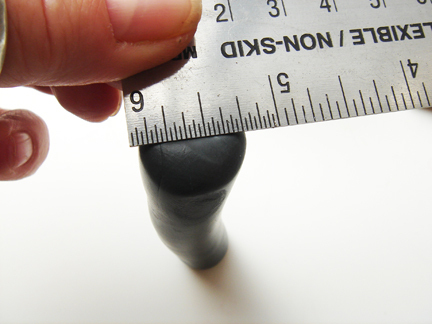 It will be like there is a whole sheet that is 2 1/8″ by 1 1/2″. 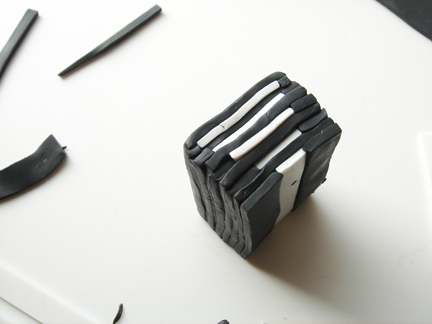 Add one of the 5 black sheets that you cut in the beginning to the stack above. 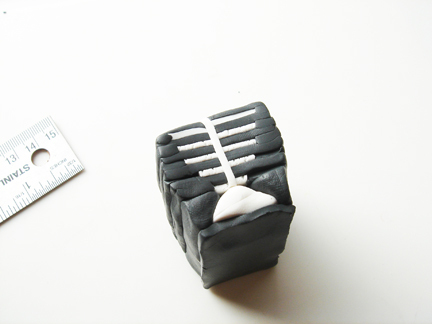 It will look like this from the side. 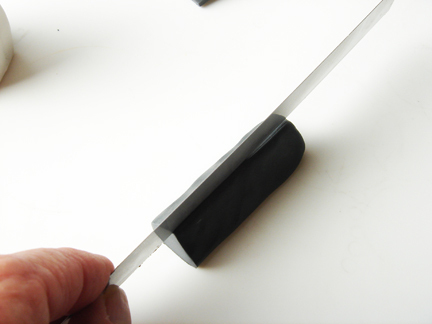 Cut off a little strip that is a bit bigger than the first ones ( 1/4″) you cut. Do this from both sides of the sheet. 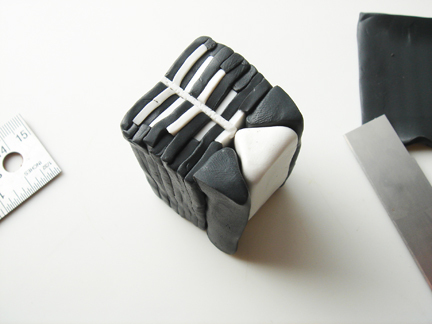 Place in the middle of the sheet of black that you just placed on the stack. 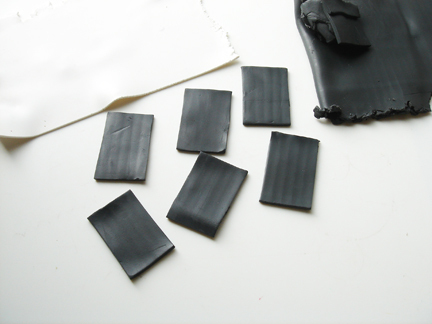 Cut off strips the same size as the ones you just cut off of the white sheet out of the black clay rolled out on the third thickest setting. 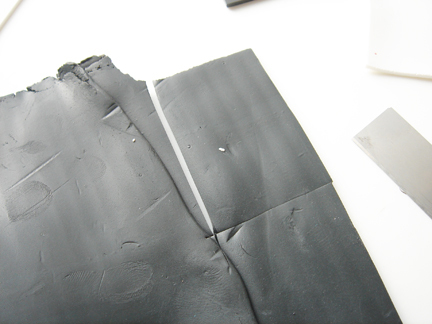 Add another one of the first black sheets that were cut. Cut off a strip on each side of one of the white sheets that you cut before, these strips will be a little bit bigger than the last strips. 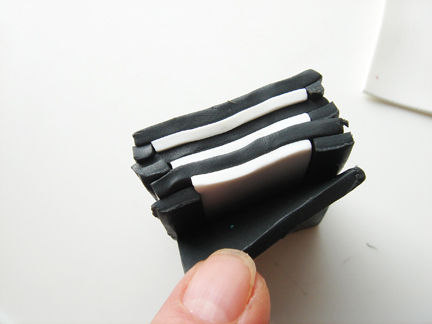 Add the white sheet that is left to the stack in the middle. 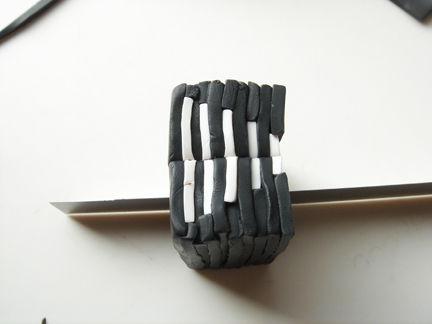 Add strips of black clay rolled out on the 3rd thickest setting to the sides of the white sheet. 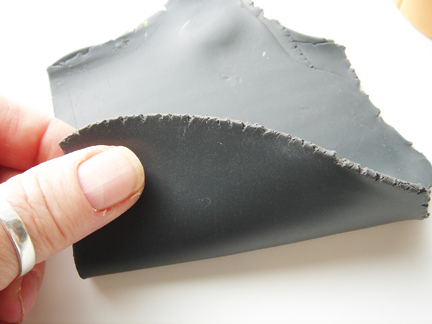 Then add another one of the first black sheets that you cut in the beginning. 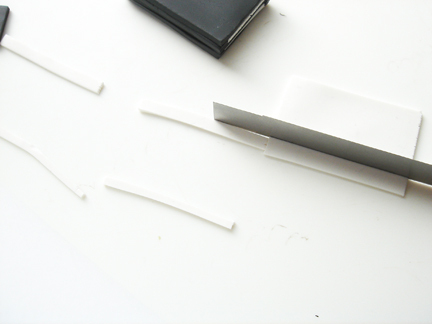 Cut a bigger strip from each side of the next sheet of white. Add the white sheet to the stack in the middle of the stack. 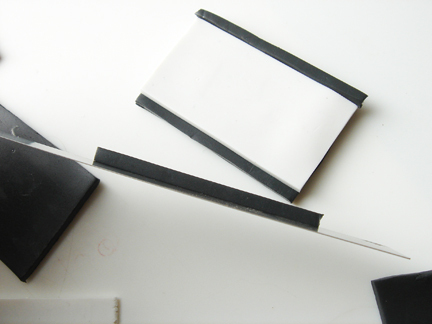 Add black strips to the sides of the white sheet. 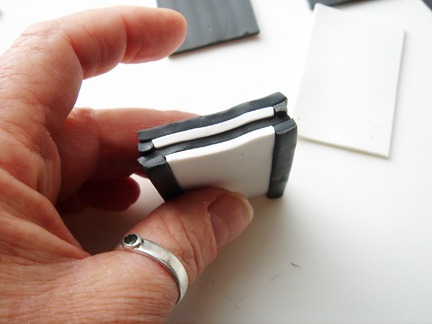 Add one of the original cut sheets of black to the stack. You can guess what happens with the next white sheet right? I knew you could. 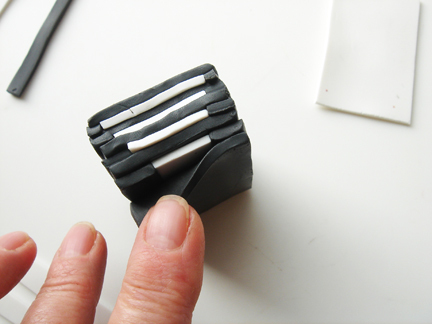 Cut strips on both sides of the white strip that are bigger than the last strips and add that to the stack. 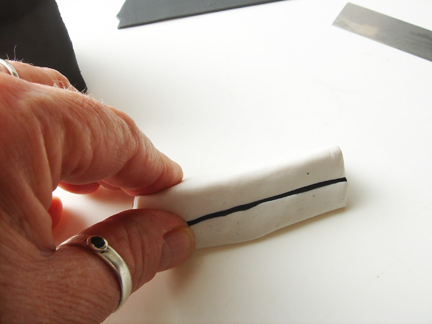 Add black strips to each side of the white sheet. Stand the cane stack on the end like you see it and cut through the center of all of the sheets. 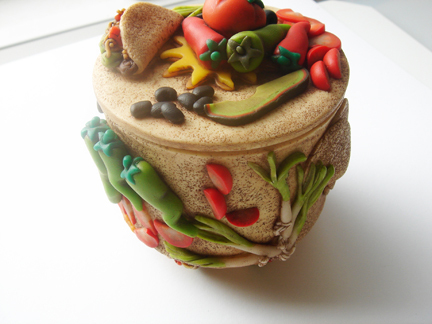 This is my post for the Fave Crafts Blog hop, Finished on the 15th. 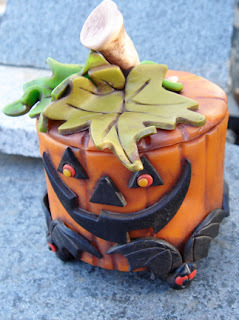 It is a themed Blog hop for Halloween and I have the chance to win 50$ worth of craft products if you vote for me. Could you please check it out. I would love to win. 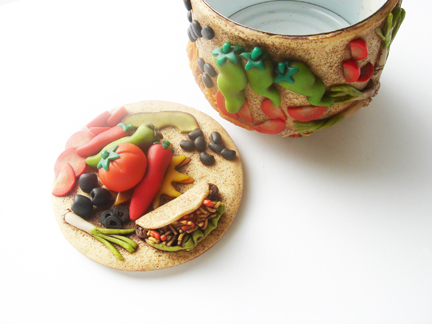 You have to go to the fave craft page (click on link of above) and like my post there. 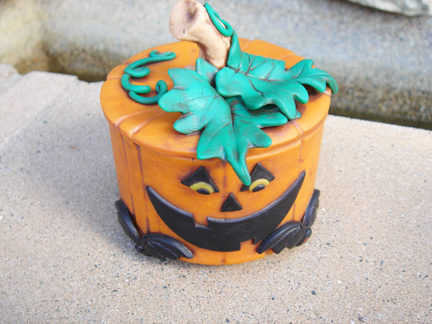 You can click on this pumpkin to to go there. Thank you so much if you do. 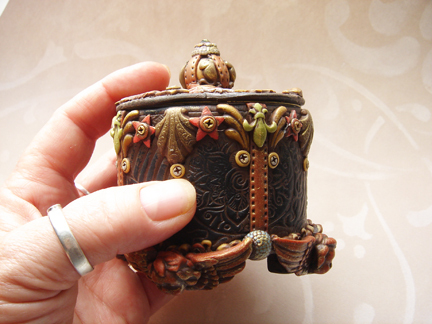 I thought you would like to see how I make the can boxes. 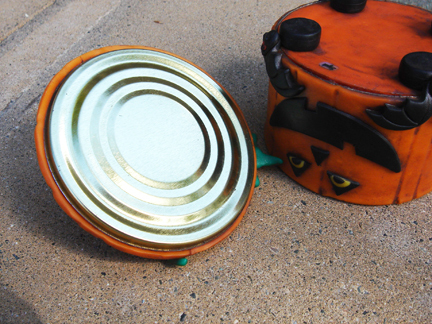 Never throw another can away again. 4 ounce Ortega chili can (You can use any can size but the cutters I am using are for the 4 ounce size can) to find the right circle cutters, put a cutter inside the lid top to see which cutter will work and then use the nest size up for lid top. I mix all of my colors equally with the same amount of biscuit. 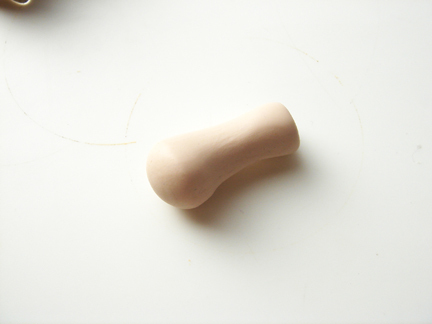 Condition some of the light green Cernit and roll out on the thickest setting in your clay machine. The mix some of the gold Cernit with the light Green 1:1 and roll it out on the thickest setting. 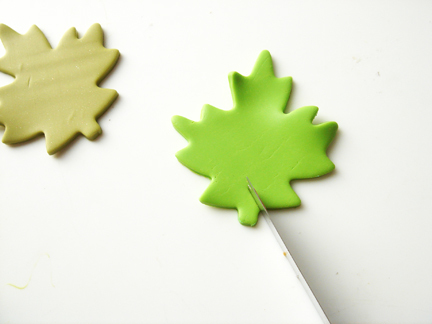 I used a maple leaf cutter and cut out one leaf in each color. 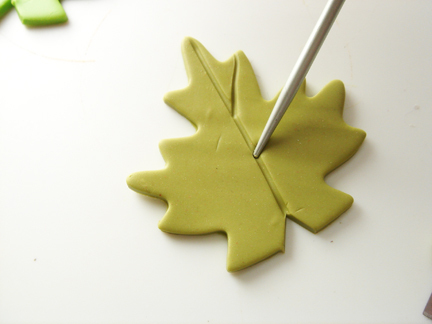 Cut out the stem of the leaf. Cut a “V” at the base of the leaf. 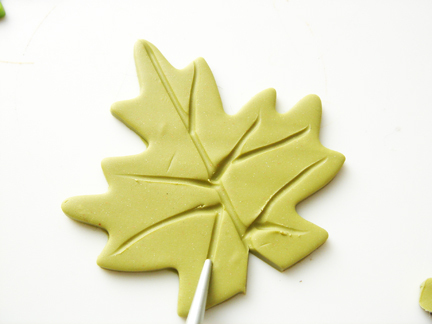 With a knitting needle make marks in the leaves you cut out for veins. 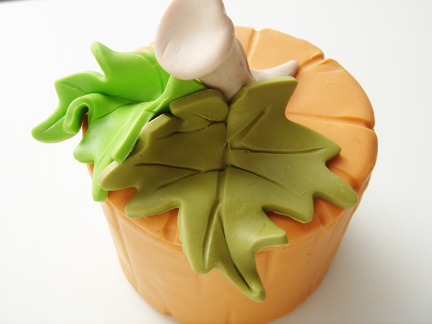 From the back of the leaf pinch down the center vein just a little. 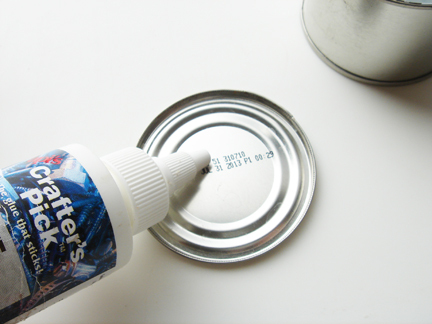 Place on the lid of the can. 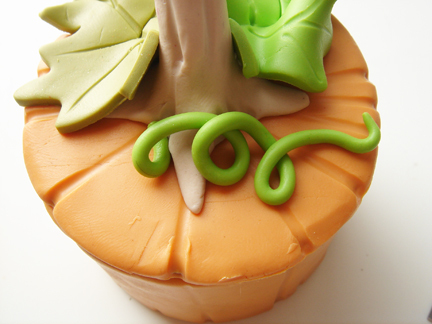 I make the leaves were the “V” is cut go up the stem a little and scrunch up the leaves to make them look real. 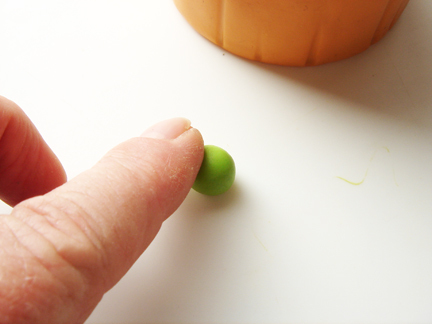 Take a 1/2″ ball of the light green Cernit and roll out in to an elongated cone about 3″ long. 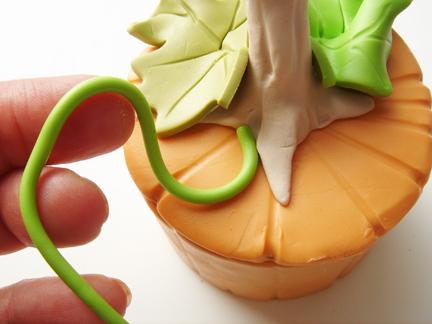 Place the thick end in the dip of the stem and curl up. 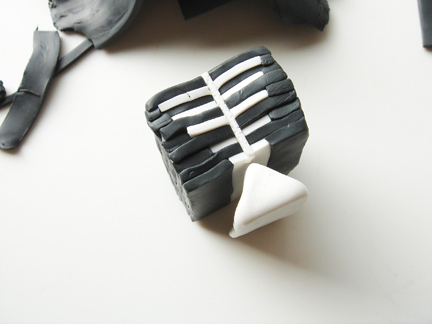 Roll out some black Cernit on the thickest setting in the clay machine and fold a part of it in half. 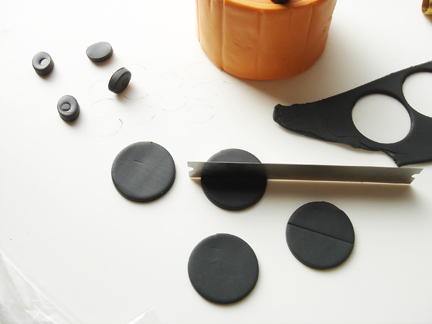 Using the 1/2″ oval cutter, cut out 3 ovals. Stack together. 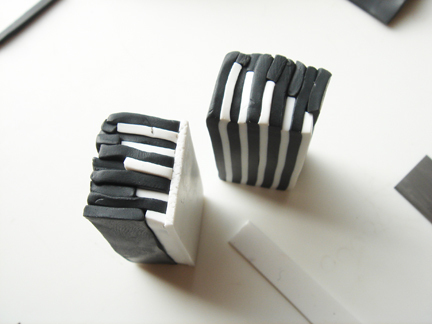 You can wrap these with another piece of very thin black clay if you wish, but I leave them like this. 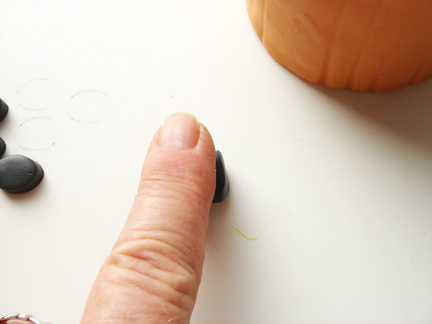 I roll them gently on the work surface to tack together. 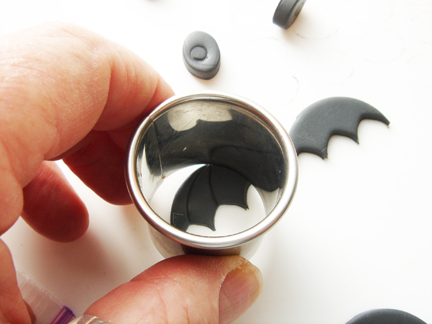 Make 4 sets of these black stacked ovals and place at four corner on the bottom of the can. 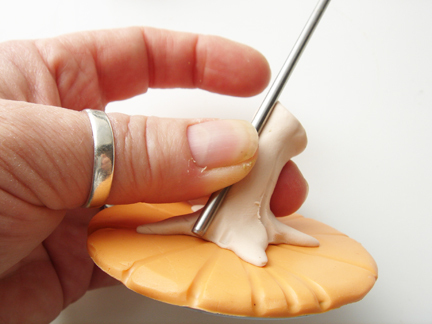 Turn the can over and place on the feet and press gently to flatten feet a little. 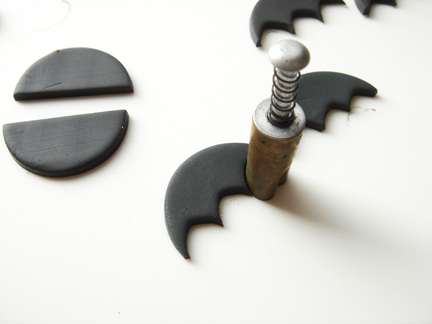 Cut out 4 more double thick ovals for bat bodies. 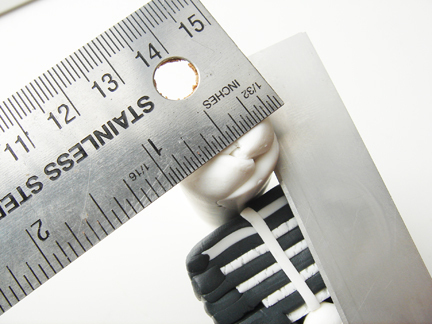 Cut out 4 single thickness rounds with the 1 1/4″ cutter. 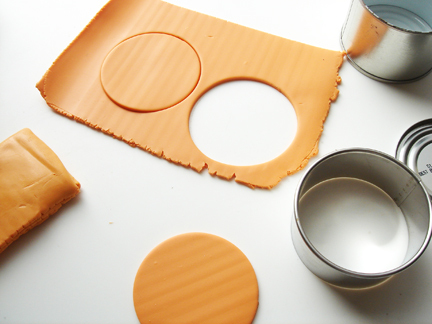 Cut those single thick circles in half. 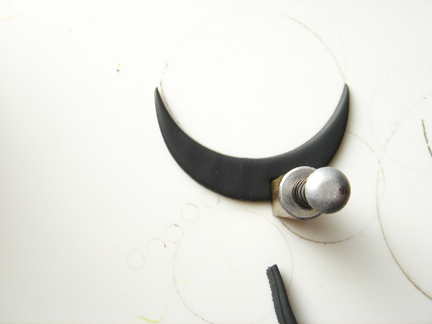 Using the point of the 1/2″ heart cutter starting on the out side of the half circles cut 3 points across the cut halves of each set. Like this. Do that with all of the sets. 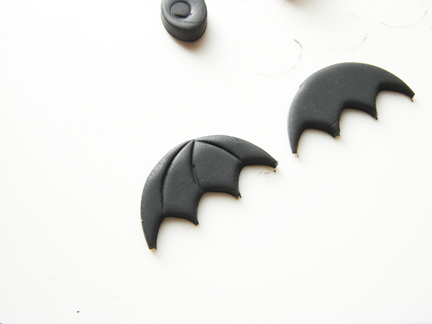 They will look like wings now. 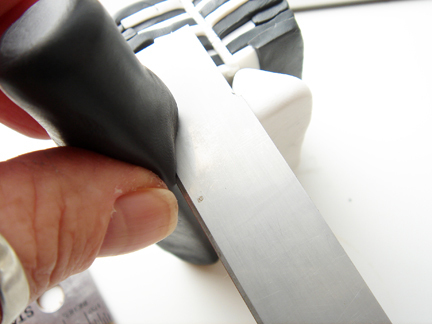 Using the 1 1/4″ cutter mark partial arcs from the points to the top of the wing. Place a set of wings over each foot like so. Roll out some of the red Cernit on the 6th thickest setting and with the 3/16″ round cutter cut out 4 sets of two each for the eyes on the bat. 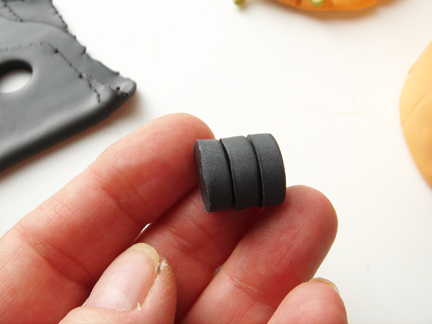 Cut out a single thickness of black Cernit with the 3/16″ cutter and roll into a short little coil and place over the red eyes. Mark in the center with your knitting needle. Do this on each bat. 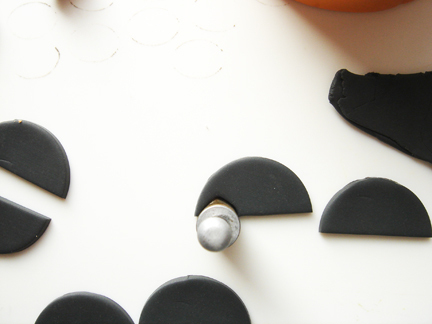 Roll another little coil of black and cut off tiny slices and roll into a balls for the pupils in the eyes and place like above. 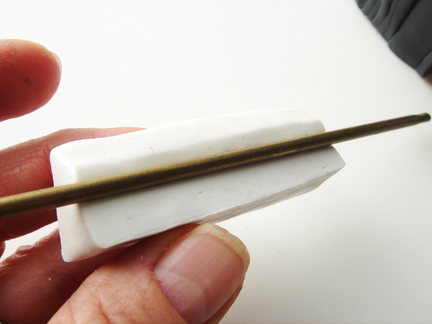 Make a mark for a mouth by moving the knitting needle. Do this on each bat. 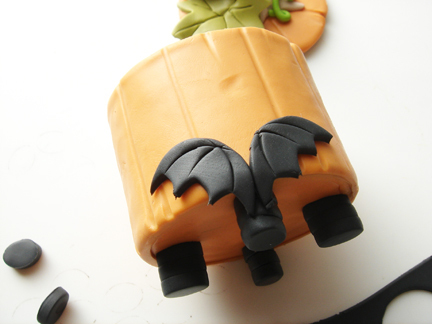 Bats done, now for the face of the pumpkin. 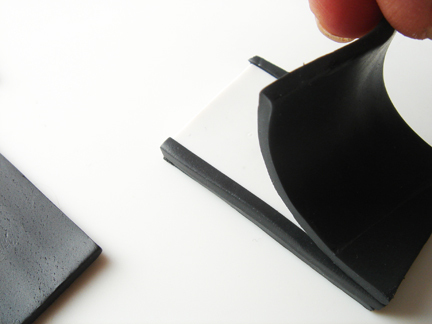 Cut a 1/2″ strip of single thickness black. Cut the strip so you have 3 triangles for the eyes and nose. 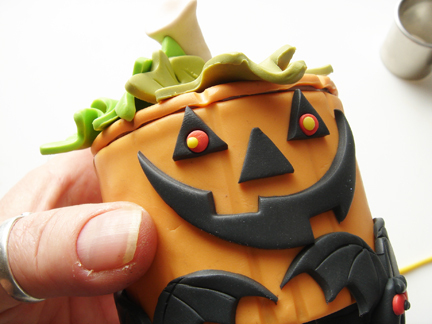 Place the eyes and nose on your pumpkin. 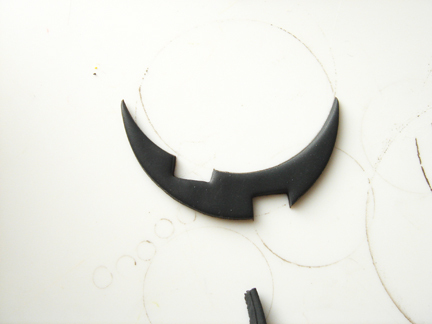 Using the 2″ cutter, cut out a round and then cut a thin moon shape. 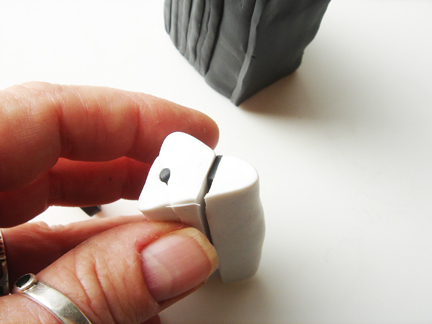 Using the square 1/2″ cutter cut out a tooth on the bottom. Roll out some more of the red on the 6th thickest setting and cut out 3/16″ rounds and place on the triangles for the eyes. 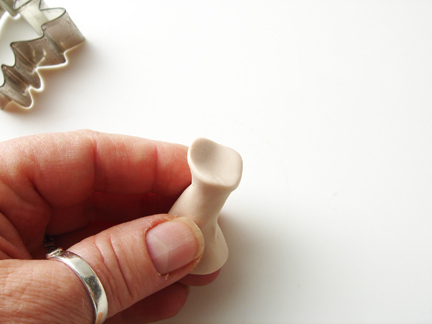 Sometimes you can place the cutter with the red clay on the triangle and pull back quickly and the clay with stay on the triangle. 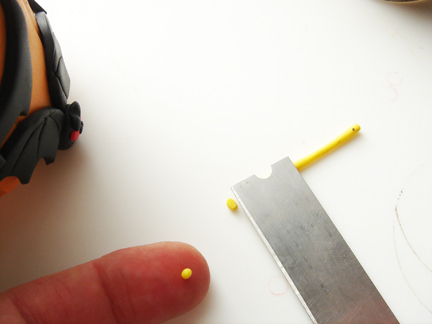 Roll out a tiny coil of yellow and cut little sections for pupils and place on the cut out rounds of red. Bake like this on a piece of cardboard shipping box in a pre-heated 275 degree oven for 1/2 hour, shut off oven and let cool. 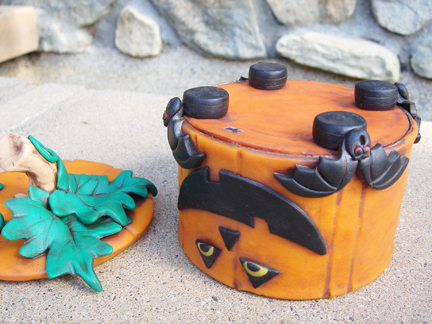 When the piece is cool you can antique it with brown Ne-Opaque. 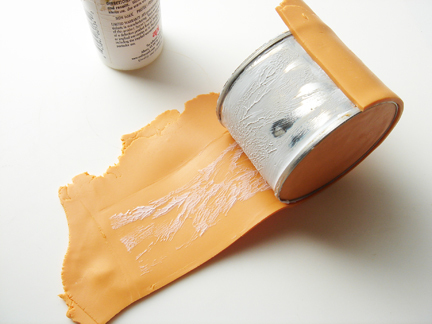 Brush on the color over the whole piece and wipe off with a damp not wet old piece of towel. It will look like the picture at the top. 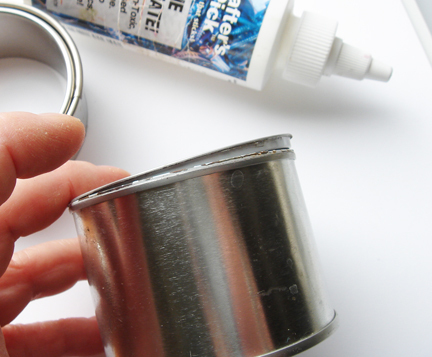 Cut off top of can with a side cutting can opener. 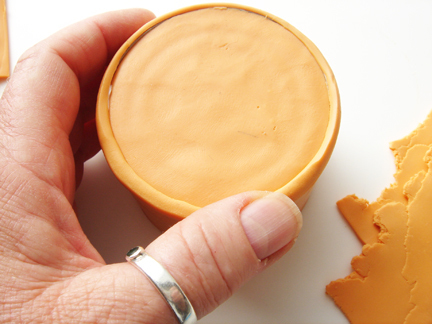 Put a thin layer of the Ultimate glue on the lid and the bottom of the inside of the can bottom and the top. 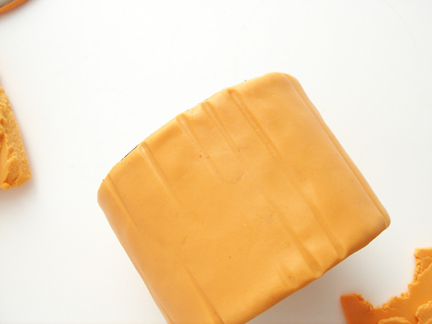 Roll out orange on the thickest setting. 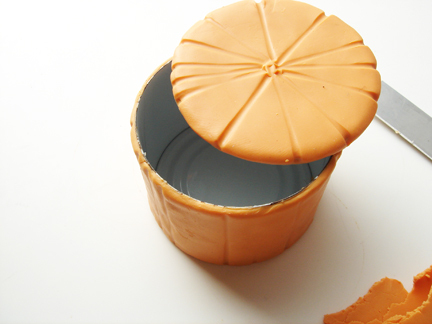 Cut out 2 circles that fit in the top and the bottom of the can and the lid. 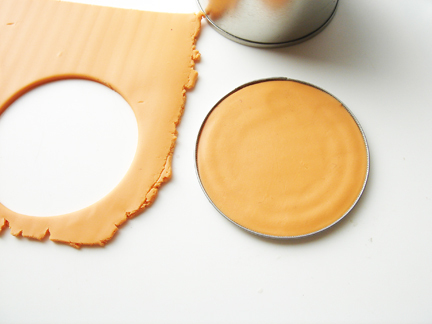 Place Orange clay circles in to the bottom and the top and start pressing gently in the center of the circles and working your way out to the edges to press out air bubbles. 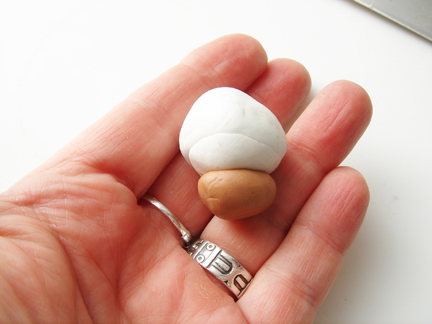 It will also push clay to the edges if you have a little bit smaller clay circle. 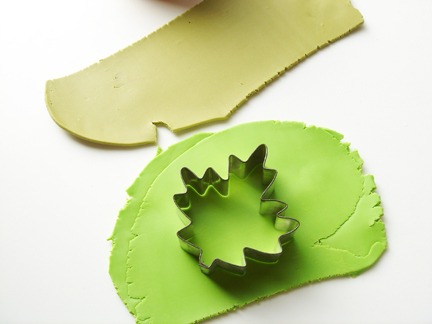 Now use the next cutter size up from the one you used to fill the top and the bottom and cut out one of those. 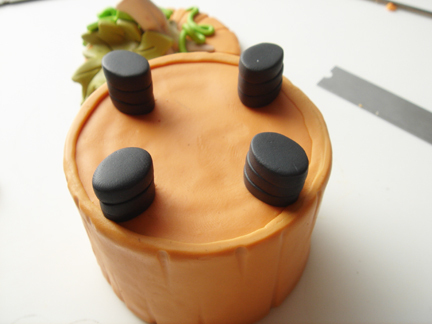 Place on top of the lid. 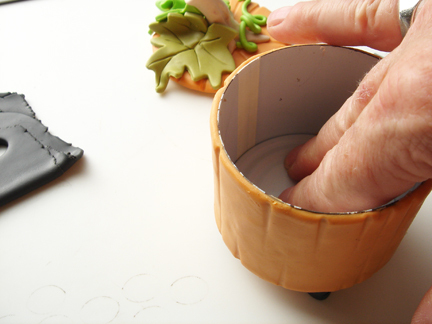 Press into the clay already in the lid and fold over the edge just slightly. 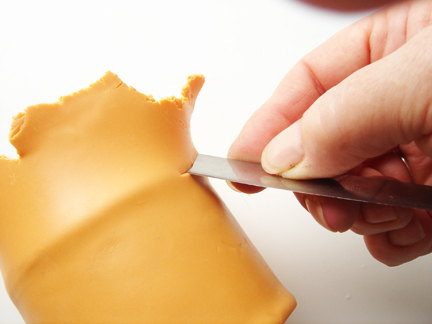 Roll out a strip of orange clay on the 3rd thickest setting and cut off the bottom for a straight edge. 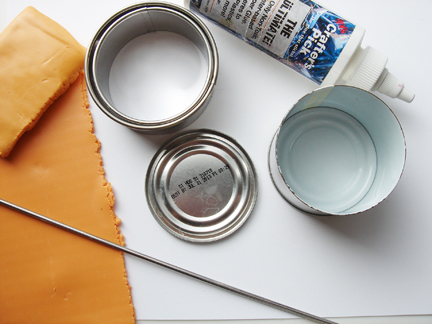 Place a layer of glue on to the surface of the can with your finger. 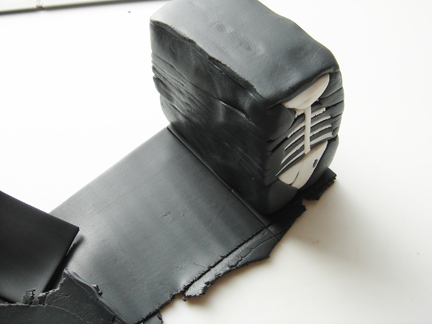 Cover the sides and the bottom edge. 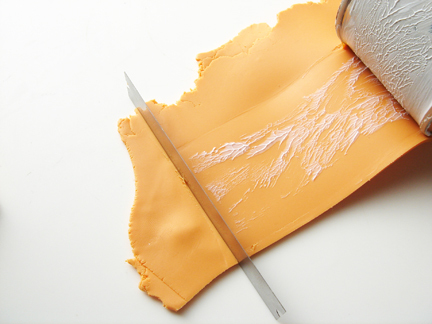 Wrap around can and over leading edge to make a slight mark so you know where to cut the strip. Press out air as you wrap around. Cut just inside the line close to the can. 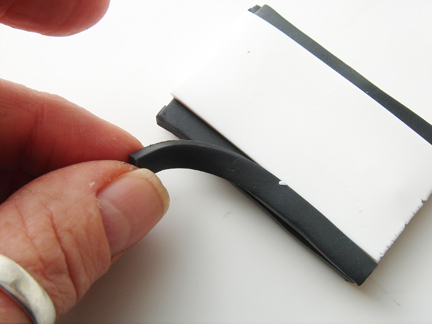 Match edges together and smooth with finger or tool. 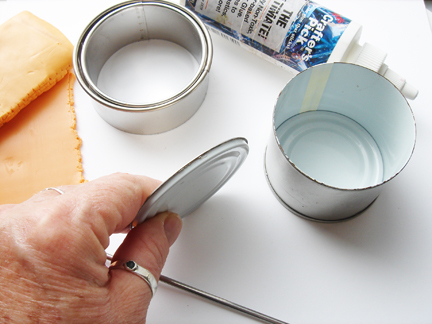 Hold blade at an angle and trim around the top of the can. 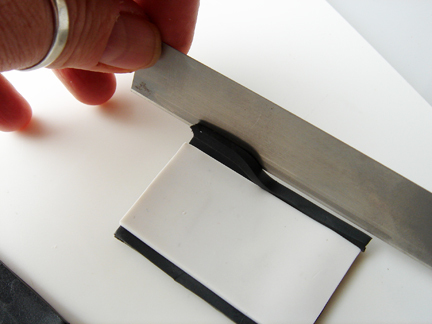 See how blade is angled down and rotate the can and trim. 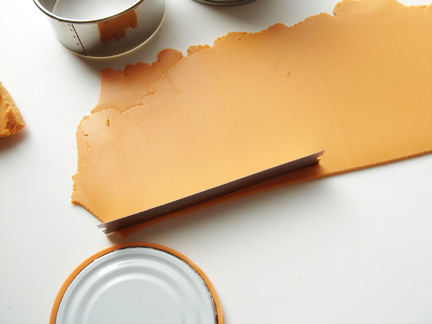 Even out the edge and press to the top of the can side. 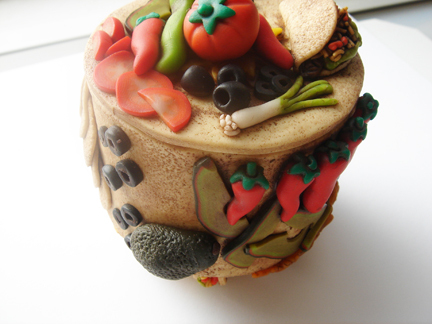 Turn the can over and press the side clay to the bottom of the can clay. 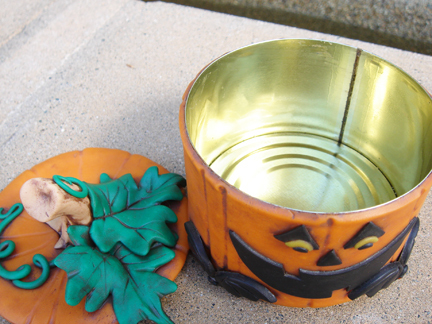 I use a 1/8″ metal rod to make indents in the side of the can like the indents in the side of the pumpkin. I make 3 close together for registrations marks. Like so. Some of the lines do not have to go from the top to the bottom and can be just marks on the top side or the bottom side. The middle of the can. You can see my three lines for registration already marked on the top of the lid. All the top side marks continued on the top of the lid to the center of the lid. 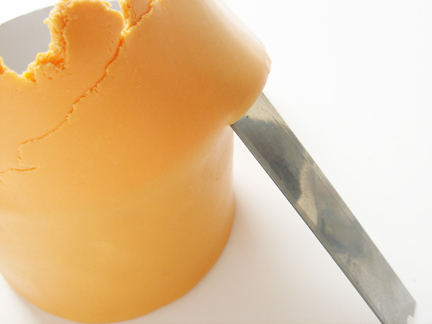 Place you blade in to the side of the lid and gently pop off the can. 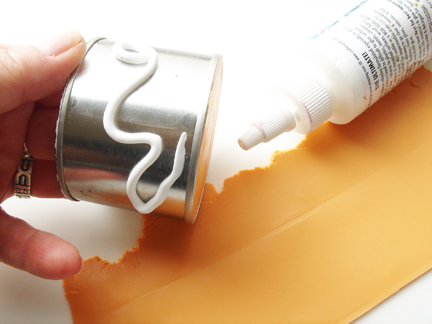 Take a 1″ ball of Opaque white and mix with a 1/2″ ball of caramel till one color. 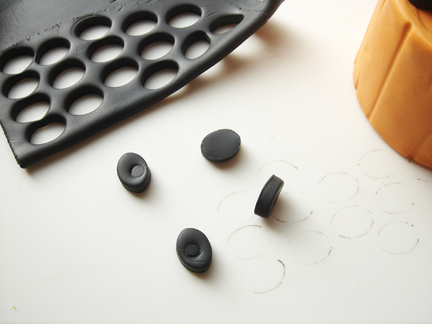 Pinch off enough for a 1″ ball and roll till smooth. 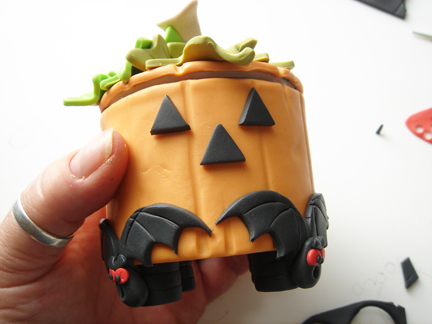 Roll into a kind of bowling pin shape. 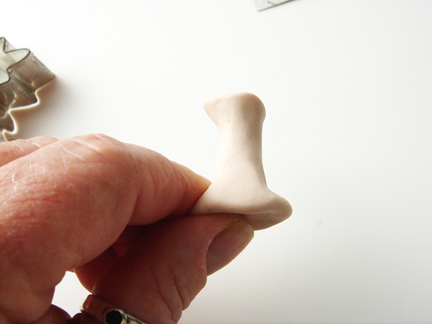 Flatten around the top edge on the smallest side of the “bowling pin”. Put a Little dip in there. Now flatten out the bottom. 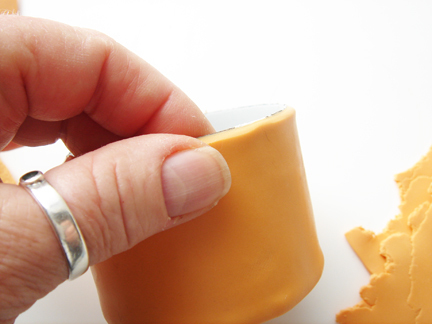 Pull out little pinches of the bottom and roll between your fingers to lengthen. 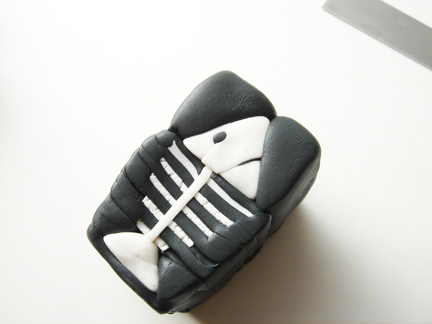 I made five little fingers in the bottom all of varying lengths. 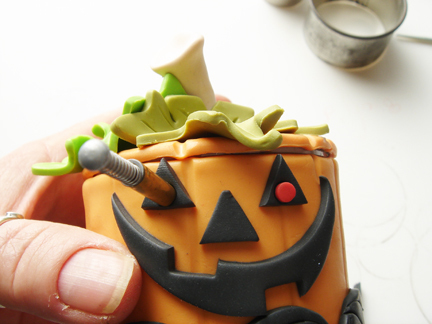 Place in the center of the lid and use the metal rod to mark up the sides of the stem. 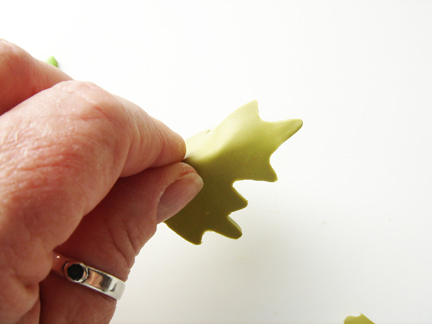 I start in the dips between the little fingers and go up the side of the stem. I did not get much work accomplished at Sandy Camp. I had loads of fun visiting but didn’t get one thing done! I made this before I left, because I had to donate something for being in the store. I donated the other Tin can box also. And I made this one for my contribution. 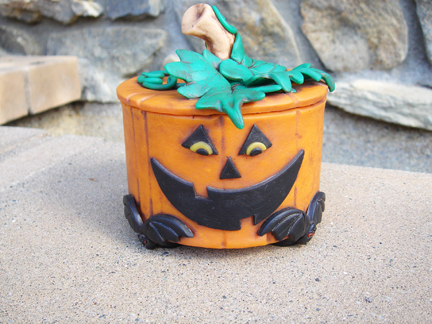 Sandy Camp was based on a Halloween theme this year, it was our 13th one. I was in my glory, I adore Halloween. Here is the top of the can. 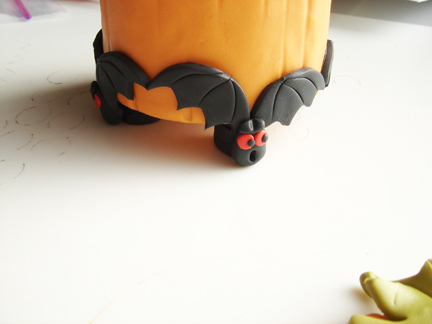 Here is the side of the can showing the little bat feet. 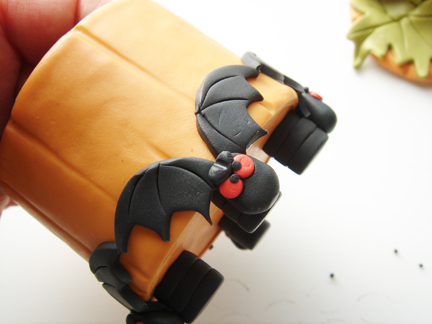 He came in on little bat feet. A view with his hat on (or top). I put my own tickets in for the other one too. The people who got them, make me happy, though. 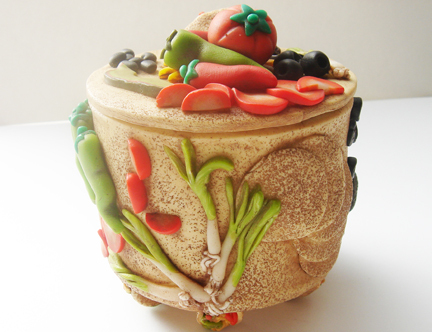 I made this one on a sliced water chestnut can.